The very idea of commerce and capitalism cannot be done away with, even when our civilization has successfully achieved the wonders of space travel, as humanity explores strange new worlds along the way. In fact, it is rather interesting to take note that lifeforms in other planets in the Star Trek universe are capable of adapting their culture into the Starfleet Federation just like that, monetary practices and all. 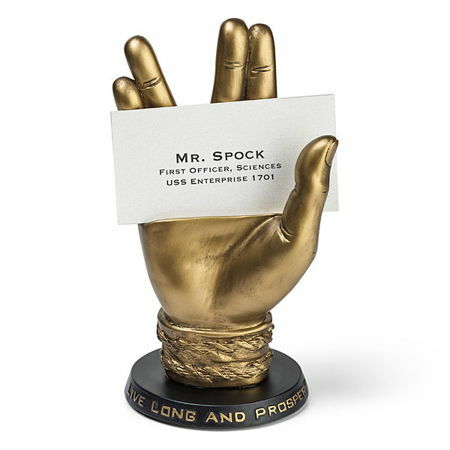 Having said that, if you’re going to do business, you might as well get all serious about it – and this is where the $34.99 Bronze Spock Business Card Holder comes in handy. The Vulcan salute will keep you going when the chips are down, and hold your stack of business cards to boot. It is made out of durable polystone and is hand painted, with the phrase “Live Long and Prosper” running across the entire base. Hopefully that applies to you and your business, too.